Output from Mexico’s auto sector has advanced at an annual rate of nearly six per cent over the last 20 years, according to Scotiabank, thanks in large part to low labour costs and its bevvy of international trade deals. The analysis of Mexico’s auto industry is part of the financial firm’s Global Auto Report, and comes as the North American Free Trade Agreement (NAFTA) marks 20 years since its introduction in 1994. “With NAFTA turning 20 years old this year, we looked at what impact the agreement has had on the North American auto industry,” Scotiabank senior economist and auto industry specialist Carlos Gomes said in a statement about the analysis. According to Scotiabank, Mexico’s auto assembly and parts manufacturing has advanced six per cent annually since NAFTA was rolled out, triple the growth in the nation’s other manufacturing sectors. That pushes the automotive sector’s share of manufacturing activity to more than 15 per cent since 1994. Canada’s auto production has dipped to 10 per cent of overall manufacturing over the same time frame, and to nine per cent in the U.S., Scotiabank said. Exports of motor vehicles and parts have also been a boom for the industry in Mexico, increasing an average of 12 per cent annually since 1994, two percentage points faster than Mexico’s overall export growth. Scotiabank said exports of auto parts alone from Mexico soared at an annualized 18 per cent through 2000 and made the country the largest exporter of auto parts to the U.S. along the way. Auto parts from Mexico now account for 34 per cent of overall U.S. auto parts imports, up from 23 per cent two decades ago. That has led to a huge jump in the amount of Mexican content in American-made vehicles—quadrupling to more than US$4,000 since the mid-1990s. U.S.-built cars and trucks only have an average of US$1,500 of Canadian-made parts, which Scotiabank said is 50 per cent above levels from the mid-1990s, but down sharply from a peak of US$1,980 in 2010. The auto industry now accounts for more than 20 per cent of Mexico’s foreign receipts, up from less than 14 per cent when NAFTA took effect. Investment in Mexico’s auto sector has spiked over the past decade, as global automakers look for low-cost jurisdictions to export vehicles from. Labour costs of more than US$40/hour in both Japan and Germany and rising transportation costs to export vehicles to North America has led to Japanese and European automakers setting up shop in Mexico. These automakers have consistently produced more vehicles in Mexico than the Detroit Three since 2007, according to Scotiabank, and now account for more than 60 per cent of overall vehicle output there. And that trend will only continue, the financial firm predicts, after overall investment in Mexico’s auto industry climbed to US$2.9-billion last year—nearly double the average of the past decade. In fact, German automakers Audi and BMW alone are both looking to build assembly plants in Mexico in the coming years, with Audi contructing a US$1.3-billion facility there that is slated to open in 2016. BMW is “in advanced talks” with Mexican officials about a US$1.5-billion plant to build its 1 and 3 Series models. Nissan opened a new assembly plant in Mexico late last year, while Mazda and Honda will begin production at new facilities in the first quarter. Audi is also building its first plant in Mexico — a US$1.3 bn assembly facility that by mid-2016 will be the sole global source for the luxury Q5 SUV. BMW is also in advanced talks with Mexican officials to build a US$1.5 bn factory to assemble Series 1 and Series 3 models. 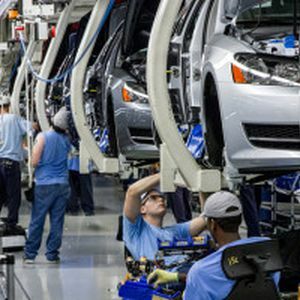 While Mexico’s low labour costs are a big driver behind its auto sector expansion—labour costs there are less than 20 per cent that of Canada and the U.S.—free trade deals have also been a huge boost. Mexico has free trade agreements with more than 40 nations, providing automakers with duty free access to more than one billion people across the globe. The U.S. remains the largest destination for Mexican-built cars, trucks and auto parts—more than half of Mexico’s vehicle output is shipped north—but exports outside of North America are growing at a faster pace than shipments to its NAFTA partners. Those exports now account for more than 20 per cent of Mexico’s overall auto industry, and provide a sharp contrast to Canada’s sector. Scotiabank said 97 per cent of Canada’s auto exports are destined to its NAFTA partners, primarily the U.S.